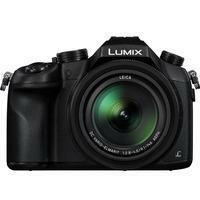 The Panasonic LUMIX DMC-FZ1000 is the world's first compact camera to offer 4k video recording. Targeted at the outdoors enthusiast, the FZ1000 is constructed around a 25-400mm f/2.8-4 lens that boasts a five-axis Hybrid OIS system for superior stability, while the 20.1MP 1in sensor promises to deliver a higher standard of image quality than that typical to other compact cameras. It inherits much from the acclaimed GH4, such as the Depth from Defocus technology and a 2.36million-dot OLED viewfinder for ease of composition in all manner of shooting conditions, while Wi-Fi and NFC technologies allow instant image sharing without the fuss of cables. Battery (DMW-BLC12E), Battery Charger (DE-A80A), AC Mains Lead, Lens Hood, Lens Cap, USB Cable, Shoulder Strap and Hot shoe cover. * - Scores are calculated by comparing numerical specifications with other cameras. The highest ranking camera for a specification acheives a score of 100. The lowest ranking camera is scored as 0 and all the other cameras are scored in between 0 and 100 according to their merit. ** - Rank is calculated by ordering the scores for all cameras in descending order. The best scoring camera for a particular feature / specification will have a rank of 1. Copyright © Link Horizon Ltd 2017-2018 All Rights Reserved.